This gives you the rare chance to dine with brilliant parrots. With a private transfer included in the tour, gain a convenient entry to Jurong Bird Park. Head over to Songbird Terrace set amid lush greenery. Overlooking the beautiful Flamingo Lake, it welcomes you with a lavish Asian buffet lunch comprising BBQ chicken dish, steamed rice, stir fried prawns etc. But the focal point of this lunch experience is the wonderful performances of colorful parrots. 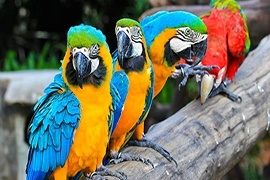 As you relish appetizing delights, enjoy a chat with Amazon parrot, watch scarlet macaw’s remarkable stunts, and marvel at the amazing problem-solving skills of the green-winged macaw, among others. Embark on an exceptional tour that takes you to some of the most incredible attractions of Sentosa Island. Enjoy a breathtaking cable ride aboard Singapore Cable Car, connecting Mount Faber to Sentosa Island. 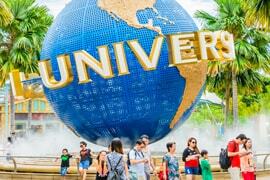 You’ll also get to experience many attractions on this full day tour, such as Madame Tussauds Museum, Quayside Walk, Miracle of Singapore, Jubilee Cinema, Commercial Square, 4D Adventureland, and Wings of Time Show. 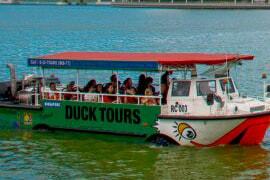 Another of the highlights of this tour is the Spirit of Singapore Boat Ride. True to its name, this all-inclusive package is a compilation of once-in-a-lifetime experiences, promising you the best-ever holidaying memories. 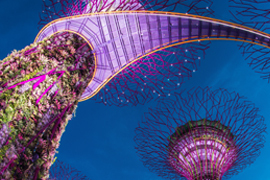 Visit Gardens by the Bay featuring the world’s largest conservatories, dine with friendly parrots, and enjoy sightseeing aboard an amphibious bus, among others, during your six night stay in Singapore. Kick things off right the most exuberant way with a Duck Tour; it journeys you across the city-state’s most popular highlights while giving you the unique chance to experience them from both land and water. Next, head out to Jurong Bird Park to dine with vivacious parrots. Featuring a sumptuous Asian lunch menu accompanied by endearing parrots’ acts and conversations, this guarantees you an extraordinary family adventure. A full day tour of Sentosa Island pulls together the best of this ultimate recreation spot, from the stupefying cable car ride to attractions such as Madame Tussauds Museum, Wings of Time, 4D Adventureland etc. Furthermore, you’ll get to spend a day at Universal Studios. Complete with seven exciting movie-themed zones, it is the region’s first theme park dedicated to absolute Hollywood-based action and thrill. Finally, take a tour of Gardens by the Bay to reconnect with nature! It not only lets you immerse yourself in its verdant beauty but also relish its many delightful attractions by way of amazing Supertree Grove, innovative conservatories, and the largest of its kind indoor waterfall. 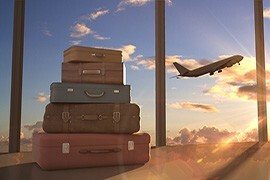 Definitely the best travel agency! Amazing six nights spent in Singapore! Every tour was meticulously planned and executed. We had no problems at any point during the vacation and for that we would really thank our tour representatives at Rayna Tours. If anyone is looking for a tour expert, look no further! I have travelled with several tour companies and would say that Rayna is definitely the best! Will like to book this tour package again with Rayna! Singapore was an obvious choice for our first international family holiday mainly because it is crime free and child-friendly. We zeroed in on this tour package as it offered the best of the city. Our 6 year old daughter and 4 year old son loved Jurong Bird Park and Sentosa Island tour. We also loved visiting Gardens by the Bay. I would say that it was the best 6 nights of our lives. Great effort and services by Rayna Tours!